Niblets is an all-too-occasional feature on the ins and outs of the Eugene food scene. Syndicate me? You know you want to. Get your last meals in at your faves soon: behold the imminent closure of a long-time Eugene fixture, Keystone Café, who will be shutting the doors for a long-deserved retirement; Kopi-O, on what we hope is a temporary stoppage due to the sale of the building; and the latest venture of Eugene restaurateur Sara Willis, Carmelita Spats, who has “decided to simplify and only do dinners when I can personally work every aspect of the dinner/event,” according to the Facebook page. She plans to do catering and other events, including a project slated for fall. Catering seems to be the way to go in this town. The Party Downtown duo has put their lunch service on hiatus for the summer months due to an upswell of catering gigs. They still serve brunch on Sundays, though! Look for more changes and upgrades as the dog days saunter on. They recently celebrated their first year anniversary, I’m happy to say. And Belly is 6 years old! Congratulations to two fine establishments. Kamitori is agonizingly no longer serving sushi, as previously reported, but the new incarnation, open Tues-Sat until 3 p.m., is actually quite lovely. And that’s saying a lot from a person who doesn’t like dining out for breakfast. Eugene so desperately needs a full service, non-greasy-spoon-diner breakfast place, and Kamitori may just be that place. It’s a rare treat to have an expertly trained, internationally experienced chef serving breakfast and lunch with an eye for quality, and the standards show it. Our baked goods and pancakes are all hand-made from scratch, made from fresh eggs and fresh milk to make them very soft and milky. NO water added. So please stop by and try our new menu including Thick & Fluffy Pancakes and Soft & Juicy French Toast, both are served with lots of fruit toppings to your taste, French-style Omelets, Japanese style Sandwiches, and Japanese breakfast & lunch, including Tonkatsu, Curry Rice, Udon and Soba Noodles. Also please try our very creamy milk-brewed Cafe au Lait, Tea au Lait, and Matcha au Lait. We sell some Japanese style Bread, too, such as Shoku-pan (milk bread), Zenryu-pan (whole wheat milk bread), An-pan (sweet red bean filling), Jam-pan (homemade jam filling), and more. And although I had my doubts at first, having tasted Masa’s zenryu-pan, a milk-based soft wheat bread very popular in Japan for breakfast, and melon-pan, which doesn’t include melons but is a soft cakelike bun with a crunchy slightly sweet topping that resembles the netting on a melon skin, and seeing photos of the thick & fluffy pancakes with a mountain of fruit and whipped cream, I was convinced that he has an idea that will draw not only locals but visitors from afar. They also serve some Japanese lunch set standards like curry rice and shio-saba yaki (salt-grilled mackerel) and even, if they have it, sashimi teishoku. So listen up: this is the perfect place for brunch with a mixed crowd, as most can enjoy a great American breakfast, some can enjoy more adventurous Japanese pastries, and the freaks like me can enjoy a real Japanese breakfast set with green tea, miso soup, rice, egg, and pickles. Yes, as in a Japanese breakfast that you can only get in a U.S. restaurant in places like San Francisco or New York, and even then only in a couple hotels in Japantown. !!!!!!!!!!!!!!!!!!!!!!!!! Told ya it was going to put us on the map. Even better: Olivo Tapas, the first solo venture of former Executive Chef of Ox & Fin and Sous Chef of Soubise Alejandro Cruz, will be operating soon out of Kamitori’s space at 1044 Willamette in the evenings. Click here for updates on opening times and a menu that’s heavy on seafood and light, sophisticated fare. Other up-and-coming dining ventures in town are all excellent food carts: Tam’s Place Vietnamese in the former Party Cart space at 28th and Friendly, nearby Green Plow Juicery (both pictured above), across the way from a sort-of interior food cart: Red Wagon Creamery’s new ice cream scoopery at the Friendly Street Market. 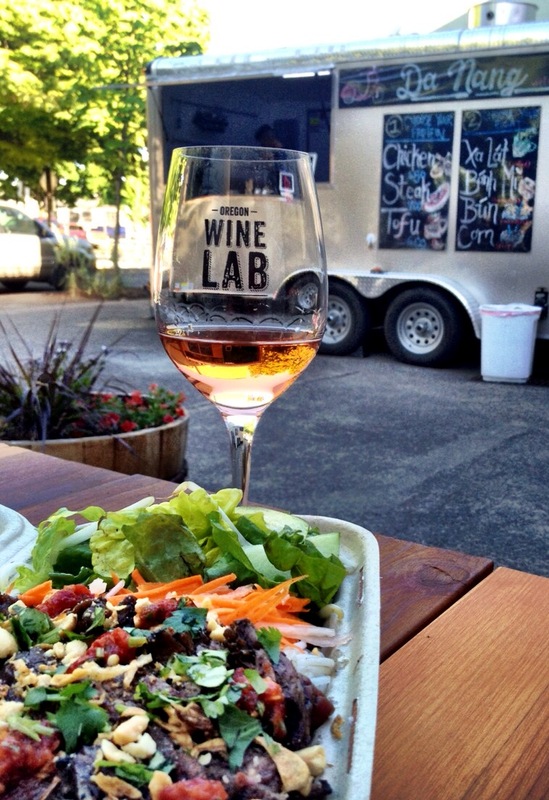 Two particularly good carts that service Oregon Wine Lab on various days of the week for the welcome experience of having a glass of crisp Riesling on the patio with your meal: DaNang Vietnamese Eatery and Twisted Tako, a fusion taco cart. I’ve yet to try Whapping, a Costa Rican Afro-Carribean-focused cart that looks promising. Check their pages for locations and times. Also look for Taco Next, a new venture with an excellent cook, on Main Street in Springfield soon (see details above on card!). Join Facebook and friend me there for updates about many more local events than I can post here on the blog. 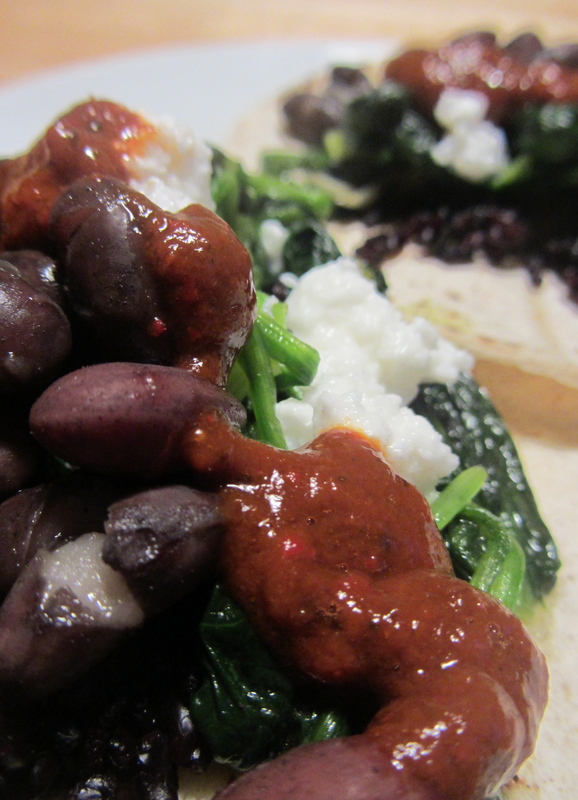 Tacos with arugula from my garden and Open Oak Farm purple barley and ‘Marfax Swedish Brown’ beans sauced in a rich deep mole poblano from Barcelona Sauces out of Bend, OR. I love these beans. They’re beautifully plump and round, and they hold their shape well for recipes like frijoles de olla or baked beans. A short tale, considering I gobbled them down as fast as can be. One of the highlights of my week is my grading session at Belly Taco Night. It always puts me in a good mood, which one needs when one is grading. Held just once a week on Mondays (5:30-9 pm), Belly Taco Night is usually quite busy, so prepare to wait just a bit. And don’t mind the lady with the stack of papers in the corner. This week, I didn’t have grading to do, so I actually read a book while eating (top to bottom) carnitas taco, carne asada special taco with habanero and cilantro salsas, and a shrimp tostada. What a pleasure. The nice thing was I was sitting at the bar, which has great light for photos, so I can finally share some photographic love. 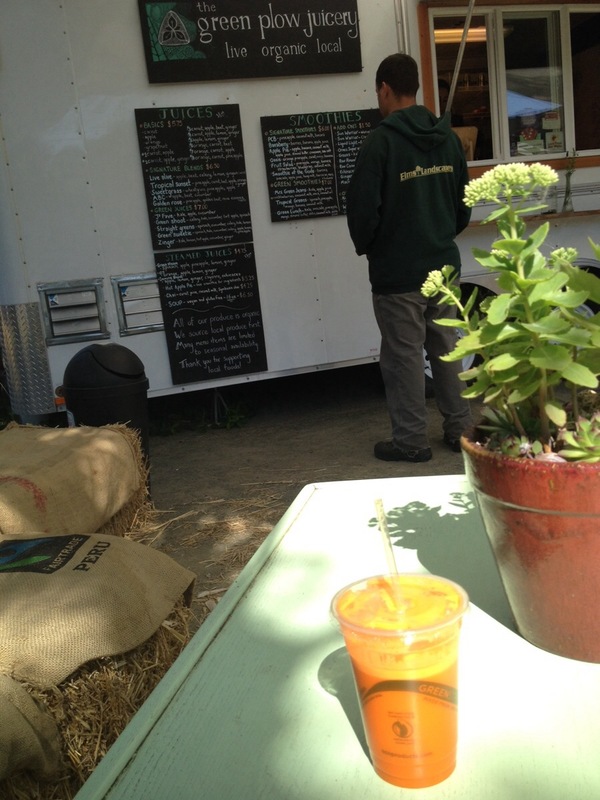 Stay tuned for news from Belly…I hear it’s expanding, just like my own belly. I’m very pleased to report I took the advice of friends and ate at Luis’ Taqueria in Woodburn as I was on my way to Portland. Woodburn is a old town with a large wart. I hope the gigantic outlet mall on the west side of I-5 brings in dividends for the townspeople, I really do. I’m sure it provides many jobs. And truthfully, the shops aren’t bad. But after watching hordes of bargain-hunters with glazed eyes and children grasping hungrily at the latest North Face jacket, I was feeling a bit claustrophobic. So I went across the bridge into downtown Woodburn, which like many small Oregon towns, fronts the railroad tracks and has a line of wood-and-brick front late-19th century shops which have seen better days. Unlike many Oregon towns, though, it has a highly visible Hispanic population, and all those shops are Mexican restaurants and markets! The 2000 census put Woodburn’s population at around 50% Hispanic, but if that area is any indication, I’d put it at about 80%. I noticed that there is a Hispanic culture festival of some sort each year, dating back at least to 1964, so the community has been around for at least that long, and surely longer. And you can see it in the restaurants. It was so nice to be in a vibrant taqueria with so many non-white faces eating very delicious food happily. 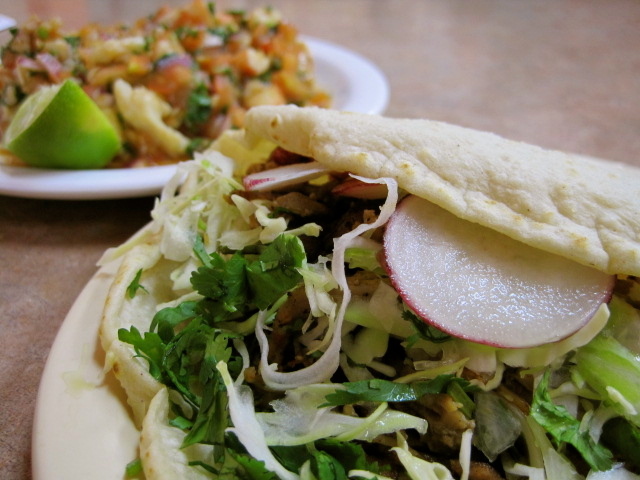 I think a taqueria is one of the most joyful places on earth. The downtown area is depressed, make no mistake. On 1st Street, there’s an abandoned movie theatre that was once probably pretty cool. I saw some aimless men wandering around that area and slow moving patrol cruisers, never a good sign. The internets also show some longstanding racial tensions in the community. But you can also see civic pride initiatives at work, too, including a spit-shined locomotive engine that is on an Oregon historical register and, I think, open to visitors. By the way, the town websites also tell me that there’s a sizable Russian population in Woodburn. The Chamber of Commerce has a rather pastoral description of the Russian community, and puts the population at about 11% (2003). I looked for Russian restaurants/markets in Woodburn, but couldn’t find any. It could be that the community is, from the looks of it, ultra-Orthodox and not very open to outsiders. I’m not sure. But any leads would be appreciated. To view Woodburn’s Russian churches, take Highway 99E south from Woodburn 2 miles to Howell-Praire Road NE. Turn left (east) and travel 1/4 mile to Monitor-McKee Road. Turn left and travel 1/2 mile to Bethlehem Drive NE. The churches are all located in the area. But back to the taqueria. You have to eat at least one seafood ceviche tostada (left in picture). Ceviche, of course, is that lime-juice cured mix of fish and shrimp with tomatoes, onions, hot peppers, and cilantro. Don’t make the mistake I did and omit the order of tortilla chips, though. 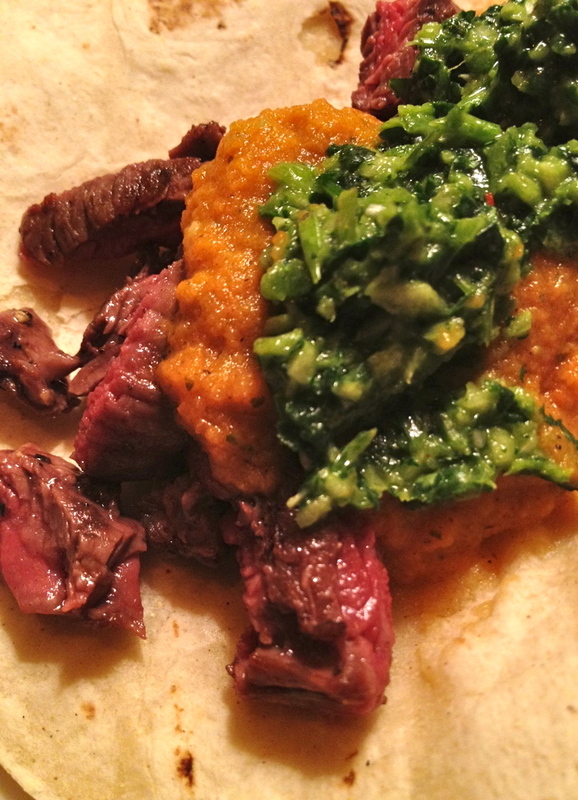 The wet marinade makes the tostada sloppy eating with your hands (who has time for a fork, thought I). And the carnitas taco was absolutely delicious, too. 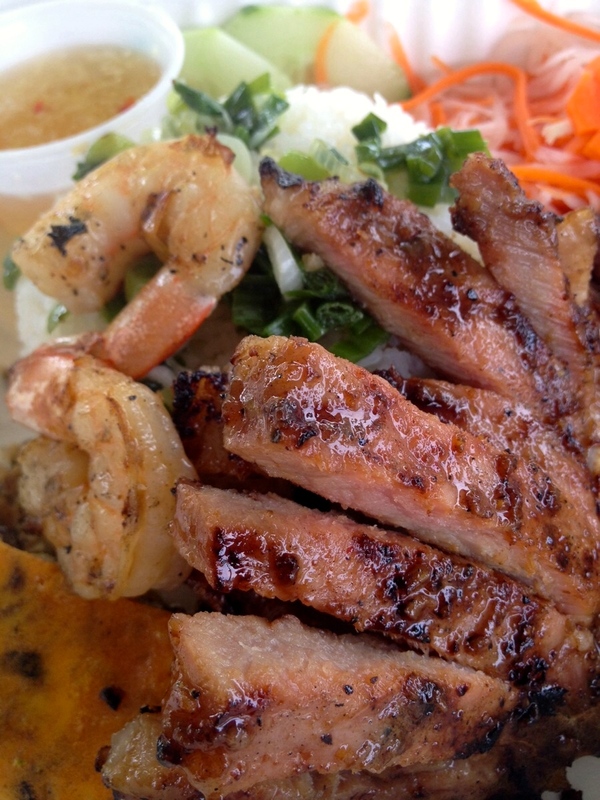 You really can’t go wrong with fried pork. You might be more adventurous and try the cabeza (pig head, which became a theme of the trip, as you shall see in future posts), adobada (stewed beef), chorizo (spicy sausage) or chicharrones (pork rinds in a spicy sauce). You can get your sopes (little boats made out of masa dough) fix or tamales (and even buy sweet or plain masa to make your own). On the weekends, they have menudo and pozole soups. The prices are great, the restaurant is family-friendly (but not obnoxiously so) and very clean. I was warned in Spanish by the cleaning lady in the ladies room not to wash my hands until she had wiped down the sink that had been sprayed with “clor.” The food is simple and comfortable — nothing fancy. But make no mistake: they don’t cut corners. 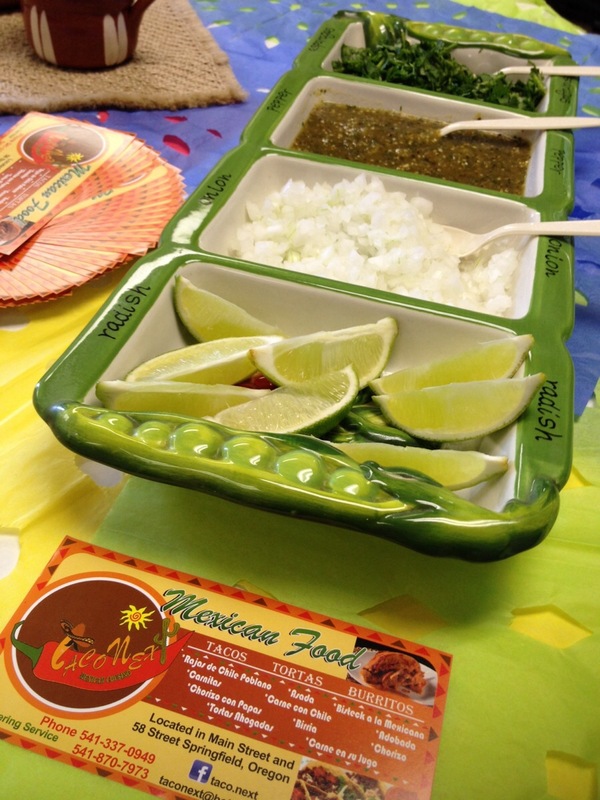 All the tortillas are handmade as you wait, and the salsas and toppings are fresh and yummy. I note with some sadness that a popular bakery on the strip has gone out of business, but a pristine and very well stocked butcher/grocer is still hawking its wares. I noticed tubs of homemade dark red molé paste on the shelves, and I really regret not taking one home. Next time! Remember how excited I was about the street tacos I ate in LA? 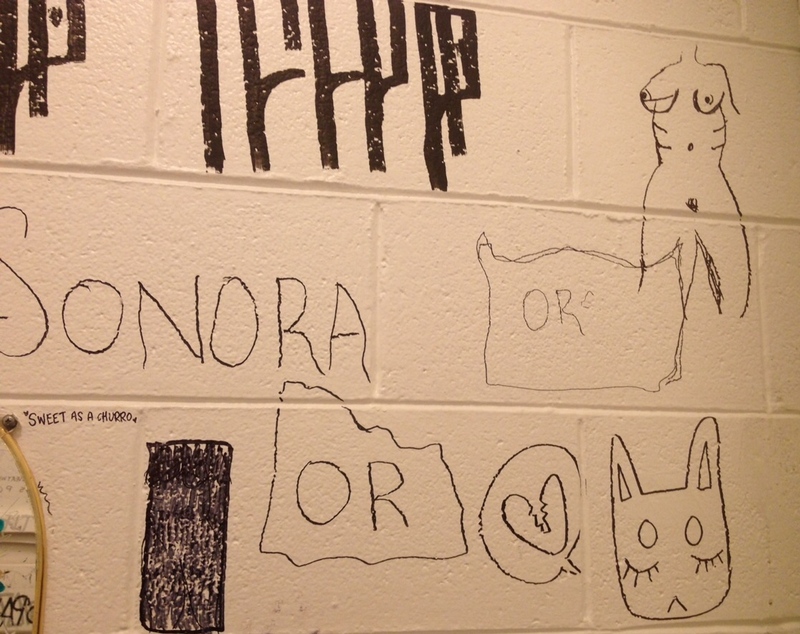 Well, Eugene, you now have a pretty wonderful taco scene. 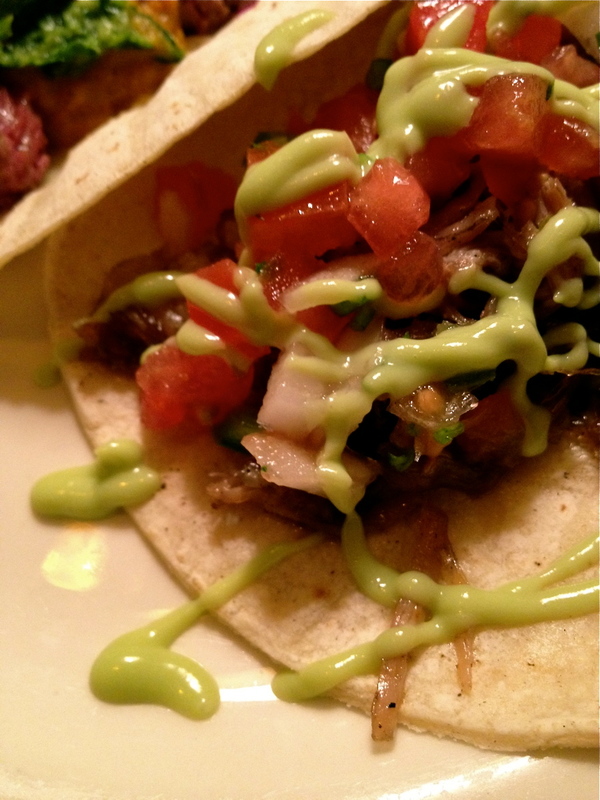 Starting last weekend, Belly has started their long-awaited taco nights on Sundays and Mondays, from 5:30 onward. 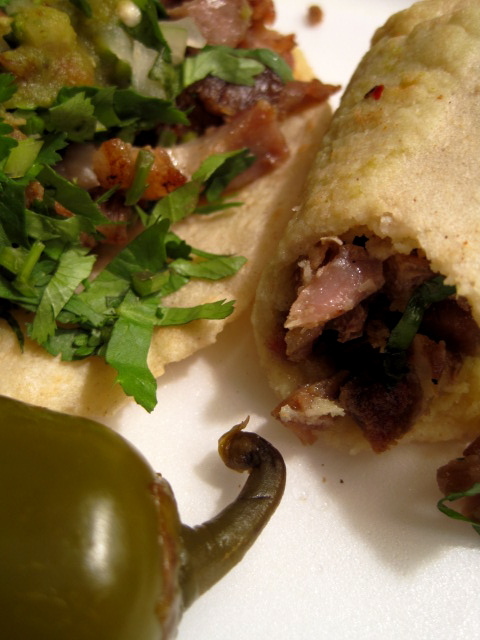 The image to the right is from those LA tacos, but you can expect to find something similar in the delicious carnitas tacos on the Belly menu. The restaurant is transformed into a cantina, with tables decked out with pickled jalapeños, and a full specials menu of Mexican drinks. Salsa and chips (or guacamole) can be had, but I was scolded by owner Brendan when I indulged in the former instead of one of the more interesting appetizers. He had a point. I could have spent the whole evening buried in a bowl of “queso y chorizo flameado,” an oozy cheese and spicy sausage dip that arrives at the table licked by blue flames. Or even a Caesar salad, another one of my fave indulgences when it’s made right. Yes, he had a point. It’s worth it, though, even if you want to sup on perfectly fried chips and a few margaritas or a Michelada. They’re that good. The salsa isn’t nearly spicy enough for me, but it’s fresh and tasty and balanced well with tomato and dark chile, and I would have been happy. Dayenu. The. Bean. Dip. It was the best bean dip I’ve ever had, fruity-hot with habanero and made rich and silken with pepitas. It was so delicious I asked if there was lard in it (answer: no). It was so good, I gave it to another table (where a friend of mine was sitting) so they could try it, and so it wouldn’t be wasted. I regret this. I should have taken it home in a napkin, smuggled into my purse, just like my grandma used to do with Sweden House chicken. Ah, grandma, when will I learn? But the problem was *everything* I tried was delicious. 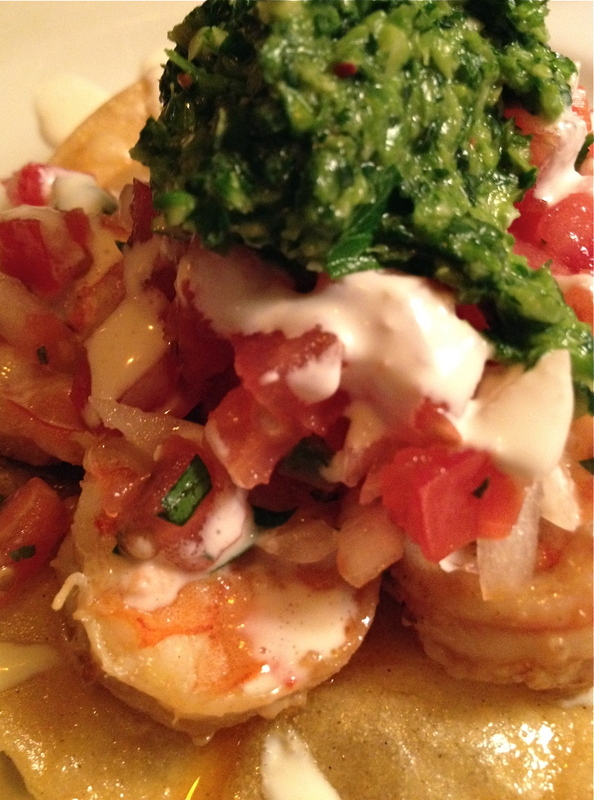 The tostada (shrimp, pineapple, and salsa fresca) was fresh and light. Pescaterians: there’s also a camarones (spiced shrimp) taco and a deep-fried scallop taco, both of which I’ll be trying soon. The adovada taco (pork braised in New Mexican chile sauce) was good, but I have to admit I liked both the carnitas and the lengua (beef tongue stewed with tomatillos and onions), which Brendan brought for me to taste in little cups, better. He said the menu was bound to change and be streamlined, so I felt a real obligation to taste everything I could. Yes, things were getting out of control. So I thought I’d go veg with a verduras taco (seasonal greens, black beans and mushrooms). If I were a vegetarian, I’d be pretty psyched about this taco. 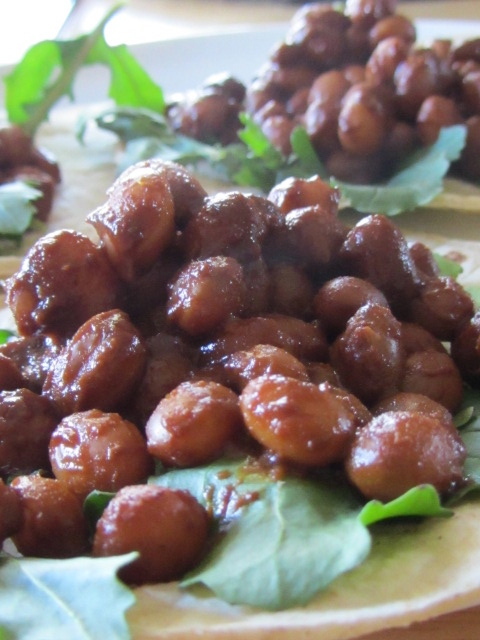 The mushrooms really make it filling and provide a good contrast to the milder bean-and-green combo. If you add pickled onions and some green salsa, available on a little table near the front door, it’s a party in your mouth. Other vegetarian options included a simple jack cheese quesadilla and another with poblanos, black beans, habanero crema and those same delicious pink pickled onions. I’m assuming you’re seeing my terrible condition by this point. Stuffed to the gills with tacos, barely able to move, wanting MORE TACOS. I was like that old battleaxe with a cigarette voice in a ratty fur coat nursing a drink alone at a divebar on Sunday afternoon. But it was Monday at 6:00, and I was nursing a tray of tortilla chips alone, my place littered with the remnants of tacos. Too much, too much. O how much can a gal handle in a town that only has awesome tacos twice a week? Belly taco nights. Check ’em out. Share the love.